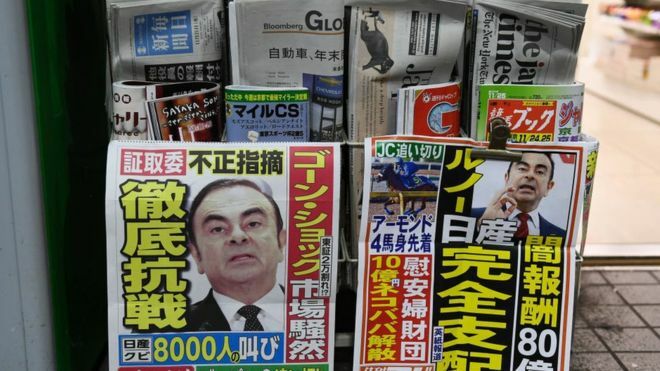 Home News Is Carlos Ghosn’s arrest a ‘hatchet job’? Is Carlos Ghosn’s arrest a ‘hatchet job’? The arrest, detention and expected dismissal of Carlos Ghosn as chairman of Nissan has been described as a “clinically planned hatchet job”. That’s according to sources close to the detained car industry executive. Mr Ghosn was arrested on Monday night charged with under-reporting his income from Nissan and using company assets for his personal use. The move has been seen by some as a bid to reset the balance of power in the Nissan/Renault/Mistubishi alliance. Mr Ghosn, who is also chairman and chief executive of French car maker Renault, was the architect of this tie-up in which Renault was seen as the dominant partner due to its 43% shareholding in Nissan, despite selling fewer vehicles. Nissan’s shareholding in Renault is only 15%. While Nissan is expected to replace Mr Ghosn as chairman with chief executive Haroto Saikawa, Renault has held off sacking him from his Renault posts. It has instead handed his duties to chief operating officer Thierry Bollore on an interim basis. While the governments of Japan and France insisted that the alliance of companies that manufactured 10 million cars last year should be preserved, it’s widely thought that Nissan executives were uncomfortable at the power wielded over the company by Renault and concentrated in the hands of Mr Ghosn. The Financial Times has reported that plans for a full merger of Renault and Nissan were advanced, but sources spoken to by the BBC insist that a full merger – to create a single company – “was never on the cards”. Despite Mr Ghosn being credited with rescuing Nissan from bankruptcy nearly 20 years ago, his hero status is said to irk some within Nissan, including Mr Saikawa. He refused to answer when questioned as whether Mr Ghosn had become a “dictator”. The charges against the Brazilian-born French citizen were levelled thanks to the help of internal staff at Nissan, who made use of a new Japanese law guaranteeing immunity against prosecution for whistleblowers. Mr Ghosn’s future at Nissan – or lack thereof – is expected to be announced after the Tokyo stock market closes at 0600 GMT on Thursday. Clarity over his future at Renault and the fate of the alliance he almost single-handedly created may take considerably longer.